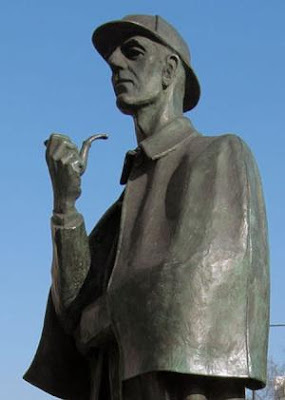 The Sherlock Holmes Society of London was founded in 1951 as a result of the work to create a Sherlock Holmes exhibit for the Festival of Britain. The Society is open to all comers – all that is required is an interest in Sherlock Holmes and his world. The minimum age for full membership is 16 but associate membership is open to all. Full members receive the twice-yearly Journal and notices of Society meetings and other events, and have the right to attend these meetings. Associate membership would suit those unable to attend the meetings but who would still like to receive the Journal. Associate membership for the UK costs £13 a year and Full membership £16 – good value if you consider the Journal alone. There is a free newsletter, available to members and non-members, published monthly called “The District Messenger“. The newletter principally covers media in Holmes’s world – film, television, audio and books. Of course there’s a shop where you can buy all manner of useful items! There’s a section covering films, television and radio with a set of downloadable plays by the Old Court Radio Theatre Company. The Society, along with the Abbey National Building Society (as it was then called) commissioned the sculptor, John Doubleday, to create a bronze statue to stand at the entrance to Baker Street Tube Station. The statue, see the picture above, was unveiled on 23 September 1999.